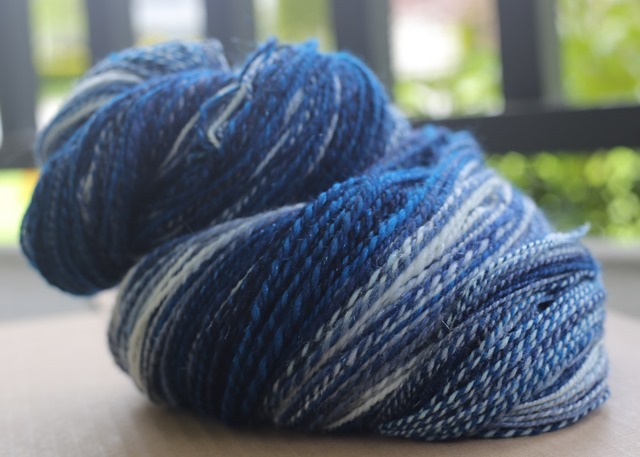 what do I want the handspun to look like? My bowl full of bobbins to ply: Traditional 2-ply, navajo-ply and buried underneath is another 2-ply. When I say ‘look like’ I’m talking about the actual visual presentation of the yarn. Singles look very different from a marled 3-ply. A bouncy, squooshy 2-ply looks very different from a chain-plied (Navajo-plied) skein. Personally, I think the 2-ply and 3-ply are the nearest to a ‘Starry Night’ but the clean colours of the remaining two are very pleasing. Another reason I take the visual into account is that different twist angles change the appearance of a yarn. 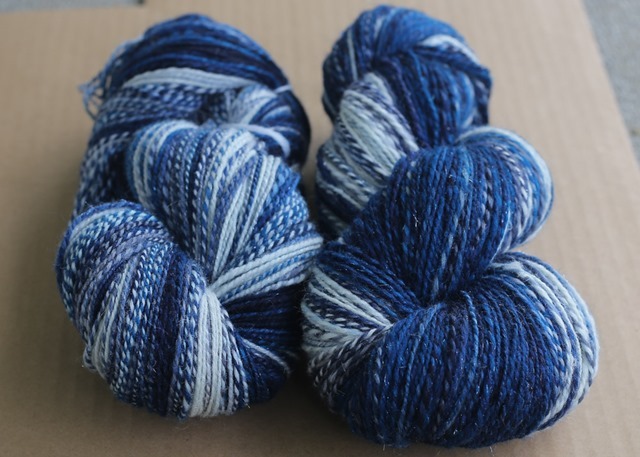 I tend to prefer high twist sock yarn if I’m going to knit a pair of handspun socks which creates a lovely skein, if you like a higher twist angle. Spun on my Kromski Minstrel set up in Scotch Tension. It was really difficult to capture the sparkle in this yarn but this photo shows it slightly. In comparison, a skein that comes off the wheel perfectly balanced sometimes end up under spun because of the phenomenon that is washing. 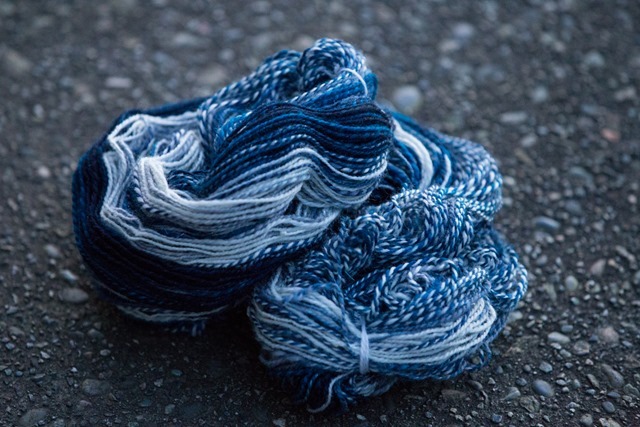 When we wash, soak, beat, thwack and any other number of things to finish our yarns, a certain amount of the active, original twist is lost in that process. I personally don’t like these yarns as much but in the knitted fabric? It’s pretty hard to tell whether it was much different from the over twisted yarn! Lastly, I was at a spinning workshop in the fall and something came up about allowing singles to rest on our bobbins before plying. The instructor asked everyone Why we thought this was necessary? I’m a big believer in knowing why we do things so I anxiously awaited the answer. 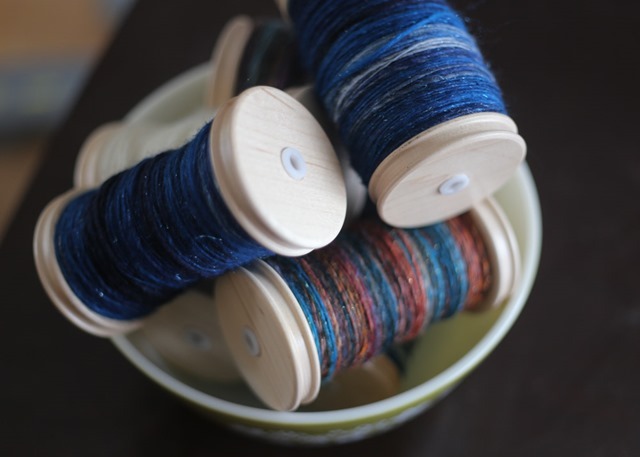 Here’s what she said: By allowing our singles to rest on the bobbins, they relax and the active twist that we see when we initially unravel our bobbins is lessened (sometimes it’s almost completely non-existent depending on how long we have left them for). There seems to be a misnomer out there that this means the plying is lessened or is made easier. 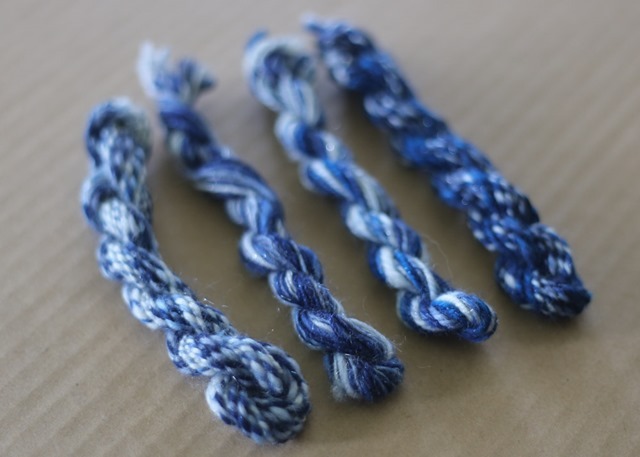 While it may be slightly easier to ply singles that don’t get all tangled up together as they come through the Lazy Kate yarn guide, the amount of ply twist needed is the same. The number of treadles per inch of yarn is the same regardless of the relaxed singles. Remember that as soon as those singles hit the water, they will bounce back into the kink that they had originally. 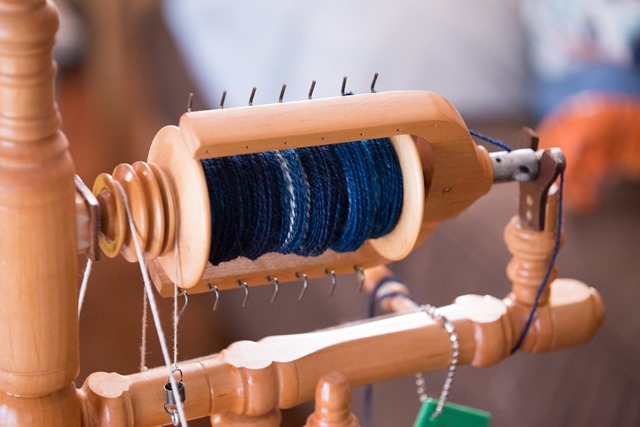 They don’t have less twist than when they were freshly spun, they have only relaxed while wrapped on the bobbin, spindle or storage bobbins – wherever you kept your singles until plying. I actually find it more difficult to determine how much twist a singles needs after resting it for too long – it’s too relaxed and I can’t tell how much twist I want. I often end up doing a couple of sample skeins, washing them and then deciding how much ply twist to put in. Otherwise, I end up with skeins that are woefully under spun. Active twist after plying & prior to washing. After plying but allowed to rest overnight on the kniddy-knoddy. All of a sudden that active twist is temporarily calmed. This yarn has left me wanting to knit a vest that was in Interweave Knits a couple of years ago. I’m going to see what my gauge is after swatching and cast on as soon as possible! I actually wish I had enough yarn to knit this sweater but I have some fibre in my stash that I’m thinking I will start working on. I would like to build a Custom Fit for that one! 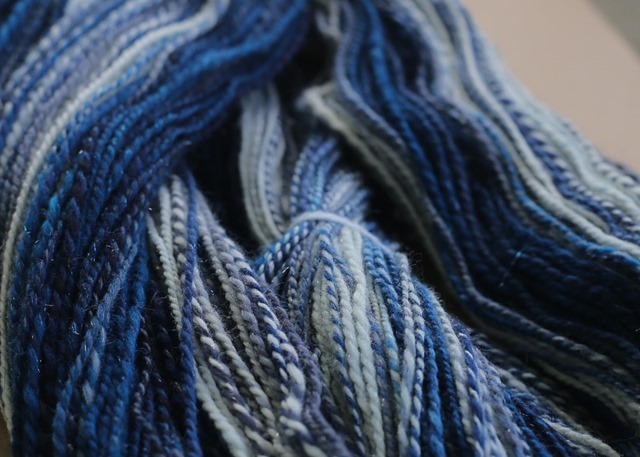 What do you look for in your finished handspun yarns? What do you like? Don’t like? How do you determine when a yarn has enough twist? Are you purely technical or does the visual appearance bare some role? Previous Post Doing what we love. Next Post blending with blends. I totally agree with all of that!! To determine how much twist to add when plying relaxed singles, you can look at the individual fibers. (get a magnifying glass!) In a balanced yarn, they will be parallel once plied. Another off-hand method, is that the plied yarn should twist back on itself a bit, or more for sock yarn. Typically, this is the eyeball method I use.